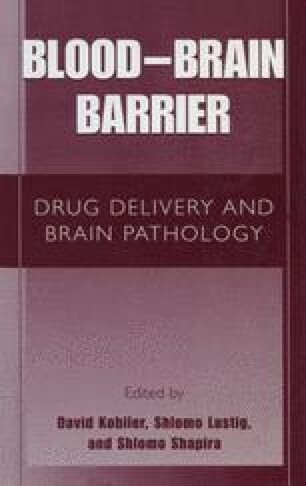 The unique microenvironment within the central nervous system depends upon the integrity of the blood brain barrier (BBB), which under normal conditions prevents the passage of macromolecules and ions into the brain. The BBB plays an integral role in the inflammatory response by producing a variety of cytokines, adhesion molecules, metalloproteinases, serine proteases, products of the arachidonic acid metabolic cascade and nitric oxide (Webb and Muir, 2000). Increased BBB permeability may occur by either direct mechanical opening of tight junctions between endothelial cells (Wahl et al, 1988), or by biochemical mechanisms (Wei et al., 1986; Trembovler et al., 1999; for review see Kochanek et al., 2000). When BBB permeability is increased, vasogenic edema is developed, contributing to brain swelling and intracranial pressure, thus exacerbating the secondary injury. Traumatic brain injury, ischemia, and inflammatory diseases induce the local formation and release of harmful mediators such as neurotransmitters, reactive oxygen species and cytokines. These, in turn, induce the evolution of secondary damage within the brain, eliciting disruption of the BBB, edema and neuronal cell death that are accompanied by motor and cognitive deficits. Local inflammation is one of the early responses of the brain to injury (Rothwell and Hopkins, 1995; Merril and Benveniste, 1996, Shohami et al., 1999).